The electoral roll is marred with irregularities such as deceased persons and multiple persons registered under a single address or non-existent addresses. The electoral roll must be revised and updated to wipe out these ?phantom voters?. The rakyat have a right to an electoral roll that is an accurate reflection of the voting population. What started as a discussion on Facebook by several socially-engaged and concerned Buddhists, about the non-representation of Buddhists in the Bersih demonstration, culminated in the formation of Buddhists for Bersih group. We had three meetings to date prior to the Bersih 3.0. 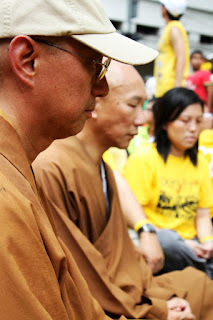 I would like to acknowledge with gratitude, the valued presence of Ven Shi Miaojan, Bro Liau Kok Meng, Bro Tan Chin Aik, Bro Mark Low, Bro Wong Choon Tat, Bro Sherab Wong, Sis Lee Siew Hwa and subsequently, more and more Buddhists came on board to make Buddhists for Bersih happen – too many to name here but I would like to acknowledge them with folded palms. As socially-engaged Buddhists, we strongly feel the need to join Bersih’s chorus for a clean and fair election because we are Malaysians too! As Malaysian Buddhists, we feel that our country needs to undergo structural changes to be progressive, beginning with electoral reforms. We also need to be seen to be standing up for a cause that we feel is paramount to the growth and development of our young nation because Buddhists can make a change with our practice of the Buddha Dharma! Initially, I was unsure about the response of the Buddhists about the idea of going for Bersih as buddhists. We had a some intial discussions at a coffee house in Subang, and subsequently at the Prajna Meditation Center in Sungai Buluh hosted by Ven Shi Miaojan. Another meeting was held at SJI (Samma-ajiva Initiative) center in Subang – and a great deal of discussions was done online. Our objective was to bring about a Buddhists’ response to social transformation. 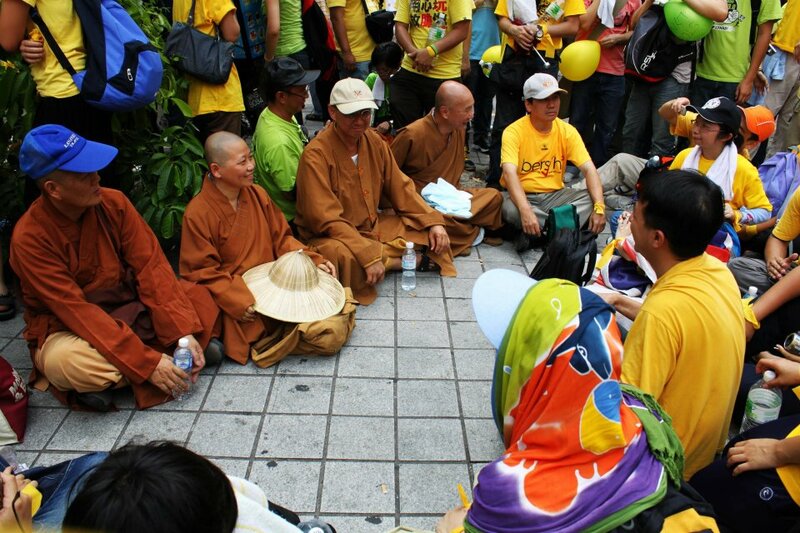 It was also a platform to generate a socially-engaged consciousness amongst local Buddhists. A facebook page was created. It started with the just less than 10 people invited into a private group. In less than a week the number grew to over 1000 members with one member inviting one another. Just before the event on Saturday, the numbers totalled over 2000 members! with many members engaging in lively discussions. About 200 people signed to confirm their participation for 428 (April 28th, the numerical code for Bersih 3.0). The discussions and interest generated was beyond what I had expected – both for and against joining Bersih 3.0 as Buddhists. We sent out an invitation for people to come join us and to endorse. Nevertheless, I felt this was a rare occurrence for buddhists to openly discuss about things that affect us all – today and in the future. In that sense, the initiative was a success! Next was the challenge to align spiritual practice with our actions on 428. With this, the MALAYSIAN NETWORK OF ENGAGED BUDDHIST (MNEB) was formed. I felt we need a purpose for our actions and our Dharma practice was to be our guiding principles. As Dharma practitioners our social action needs to spring from the depth our practice and spiritual traditions. The Buddha’s teaching is fundamentally about dukkha and the end of dukkha. Dukkha can be translated as suffering, unsatisfactoriness or situations of pain and difficulty. Dukkha can manifest itself both mentally and physically as well as collectively, we call this structural dukkha. As reminded by the Buddha in Majjhima Nikaya 22, ‘I teach only Dukkha and the end of Dukkha’, He inspired His follower when He reached out to help everyone he met and gave them a lifeline to overcome dukkha. The Buddha did not stop there. He saw the interconnectedness of nature and events, and responded to structural and societal dukkha. He was fully aware of some of the social issues and challenges of His time. He made conscious and deliberate decisions to address social issues that hindered peace, justice, freedom and above all, spiritual development. He removed the caste system that plagued so many people in India during his time, giving the equal opportunity to spiritual practice by ordaining followers from all walks of life and putting them all on equal footing. The Buddha addressed the equality of women and gave equal opportunity to women, unheard of at that time, to be ordained as bhikkhunis (nuns). It was important to highlight that Buddha praised and promoted peace within society as well as amongst individuals. The J?taka says: ?Let us train in peace because this is praised by the Buddhas.? (Ja.IV,211). The Buddha commented that even the gods envy the person who lives in peace (Ud.30). He described himself as ?a reconciler of those at variance and an encourager of those already united, rejoicing in peace, loving peace, delighting in peace, speaking in favour of peace? (D.I,4). But the Buddha was not just at peace himself, nor did he merely speak up for peace, he also actively did what he could to promote it. On one occasion, the S?kyans and their neighbours the Koliyans, were about to go to war over the water in the river that divided their countries from each other – the Buddha stood in between the neighbors, intervened. Spiritual practice is not separate from social engagement. 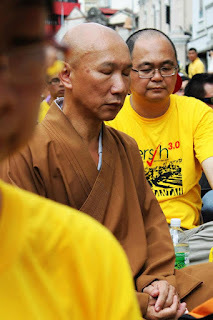 The night before 428, Bro Liau Kok Meng was invited to give a talk at the the Bodhi Buddhist Society in Kuala Lumpur (the meeting point for Buddhists for Bersih on 428). Bro Liau, spoke about the need for Buddhists to participate in Bersih 3.0 and its implications. He also shared his experiences over the previous rallys he participated and inspired the mostly young and young-at-heart audience. I took the mic for a short address to reiterate the points by Bro Liau and reminded everyone thar it is our duty as Malaysian citizens and Dharma practitioners, to take our spiritual practice to the social level to effect change. Many of us recognize that our country is in crisis, and is in dire need for greater peace, freedom and liberty. One of the drivers of change is to have open and fair elections where each and every Malaysian adult vote is considered and recognized. As a nation, we must move towards being a nation with a high level of integrity to address structural dukkha where all people have the opportunity to lead freer and happier lives. Our meeting and gathering point was the Bodhi Buddhist Society on Jalan Sultan, one of the Bersih-designed gathering points. Some members stayed at Bodhi after Bro Liau’s talk – most people arrived in the morning – way ahead of the scehduled 12.00pm briefing. Prior to 428, key messages and reminders were sent out and shared via Facebook and reshared. Our activity started with the chanting of Ti-sarana and Panca-sila followed with a briefing by Bro Liau and I to remind participants of Buddhists for Bersih that throughout the sit-in protests and the walk to the destination, we shall not engage in any acts of violence, or chant and shout like the others. We will not even raise our hands in a fist but will maintain calm and peaceful always. The group was also reminded that during the sit-in we will be quiet and perform meditation of metta to all. We aim to create an aura of peace and to show that the voice of transformation can be a silent and peaceful one. This was followed by the do’s and don’ts by veteren activist, Bro Chong Kok Siong. This briefing provided some interesting insight to what to expect. Of course our young amateaur participants were excited! We were also reminded of the dangers which were real – there was a real chance that some of us may get arrested, sprayed with chemical-laced water or smoked with tear gas. My thought at the moment was, we were not there for the excitment or to be arrested – we were there to make point. Safety of the group members and Sangha members were my utmost concern. Promptly after the briefing, participants were given packs which contained salt, cotton and what turned out be the most important item: yellow cloth bands. 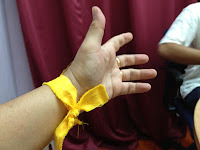 We tied the yellow ribbons around our wrists to signify that we are participating as Buddhist praciticioners. This turned out to be most helpful in keeping the group together as anyone who had strayed could just raise the hand to show the yellow wristband and other members would help him or her rejoin the main group again. We appreciate with thanks the members of Bodhi for making the packages neat and handy. Several members of the group volunteered to be marshals. The marshalls will keep the group together, keep the group calm. In just a short 5 minute briefing, off they went, going about their duties. Talk about efficiency! I estimated the number of participants in our group to be about 100. We were very inspired by the presence of Sangha members in our group. We would like to acknowledge the presence of Ven Ji Chen, Ven Shi Miaojan, Ven Kong Yen and Ven Hu Yue. I was particularly happy to see members from several Buddhist groups including a few who came all the way from Penang. I was also especially happy that my dad turned up, all the way from Seremban, to join me in this cause! At least one other member came with his dad too, that was fun! Also nice to see spouses coming together as well. At about 12.40, we started out from Jalan Sultan, marched towards jalan Tun Perak, and turned towards the Dataran on Jalan Leboh Pasar. We joined the rest of the Bersih participants near the Central Market and made our way along Jalan Leboh Pasar towards Dataran Merdeka. During the walk, some members broke away in the crowd. All we did was then raise our hands showing our yellow wrist band and we all came back together! Yellow Cloth on our Wrists – A Symbol for Unity for Bersih? By the time we reached Jalan Leboh Pasar, we were blocked. For a while we were wondering what was happening and perodically we had to make way for ambulances to pass in order to reach some injured participants in the front (no I did not think at that time they were beaten in anyway although heat was unbearable at one point). I thought our group was the most popular and attracted a lot of attention from photographers, news media, bloggers or just curious people. It was the presence and aura of the Monks and Nuns that probably did it! 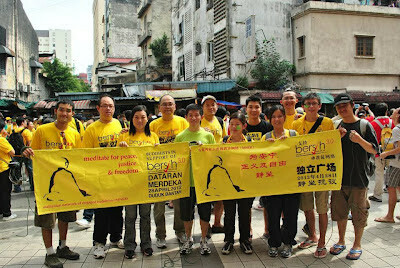 Some other Bersih participants even stopped to take pictures with them! Our group was definitely a curious attraction! After a few renditions of “Negara Ku” and waving at the hovering police helicopter we began to sit. We sat, for less than an hour – some meditated, some chanted, but mostly we were quiet and peaceful. Some strangers asked what we were doing and after explaining to them that we were meditating, they joined us to sit together. I saw that we were the only organized group that was sitting quietly. Many people saw and asked curious questions. As we were sitting the crowd was clearing. It seemed that some other marshalls were directing people to Jalan Tun Perak and some to Masjid Jamek. My gut feeling was to stay away from Masjid Jamek. I wasn’t sure if we should move. We did make the decision to move from the middle of the road to the nearby pavement. The monks and nuns sat under a tree – now, how Buddhistic can this be! At this moment, I was aware of a couple of things. Firstly, the police were advancing with the water cannons. Not good! Next the pushed back frontline. I was more concerned about the large group at the front facing the police. I walked up to the front line to assess the situation. What I saw got me more than a little worried. The police officers had disappeared! And in place of them, the Police strike force was in prepared position to attack! In the crowd at the front lines, I saw several people, about 2 or 3, shouting hate slogans trying the work up the crowd. There were also several groups giving different instructions. I had a bad feeling in my stomach! I told our members to stand down and return to Bodhi immediately. At that time too, we heard news of Ambiga calling for the end of protest. We organized our group, still sitting at that time, and we walked peacefully and in a dignified manner back to Bodhi. On our way back, we were encouraged by the fact that the Police there were stopping traffic to help us get back. I explained to the officers that we were done with our duties and that we needed help to cross the road to get back to our center – and they agreed to help us! We shook hands and continued walking. It was calm and cordial. When we finally reached Bodhi, we felt that our message was successfully delivered. We concluded with a sharing session and dedication of merit. We parted ways after that and bid farewell to one another. Overall, I felt our mission was accomplished! We came out as Buddhists to make a silent statement for peace. I also felt that we had brought out Buddhists to talk more openly about social engagement in a positive way. I hope this discussion will continue for a longer time. My gratitude and appreciation to all for the day. After I left Bodhi, I bid farewell to my dad who wanted to stay in KL a little longer and take the bus from Pudu Sentral. I headed to Pasar Seni LRT station to take the train back hopefully in time to catch Arian’s aikido grading test. When i got on the trains, many people were also leaving. My train was full. Shortly after that my dad called and told me that the police were firing rounds of tear gas and going after people. He got a sniff of the tear gas too. I advised him to turn back and take the train back instead. Only later did I realize the extent of the violence. I was trying to piece the story together, calling friends and checking on the internet. I was worried my dad might be caught in the middle of it all. Fortunately, he did get to the train station and left Kuala Lumpur without being harmed. I cannot say that for many other people who took the brunt of the police force. Half an hour later I reached Petaling Jaya, in time to catch Arian’s Aikido grading test. My dad reached Seremban about 2 hours after that. I feel deep sadness for the unnecessary violence and confrontations in different parts of the city. It was uncalled for. We must make every effort to stop violence, not perpetuate it. In violent situations, there are always many sides to each problem. We need to hear out each side and allow healing to take place and in situations that warrant investigations, do allow investigations to be carried out. Let’s isolate the problems and deal with the real people involved, right up the chain of command. We cannot blame the entire Police force for the brutality. I felt the Police were quite restrained in my opinion. Likewise, we cannot blame the entire Bersih for the violence. Being led by emotions, brings anger. Anger brings hatred and hatred bring about violence. There has to be balance and clear-mindedness. Let us keep to our objective that with calmness and clarity of mind, we support the need for electoral reforms. Our support is through meditation and metta. Let us refrain from generating more anger and hatred. Do not post or share videos and pictures that blame one party over others. Instead, frame them with comments and thoughts that leads to reconciliation. We all want to get to the bottom of these violent incidents? It is not the time for blame, but the time to listen, to understand and to reconcile. I pray and hope that the anger will cease from everyone’s hearts and may we all find peace in our own hearts!